HostDime Review 2019: Is HostDime a Good Hosting? Mexico-based HostDime is an enterprise-level web hosting provider specializing in dedicated servers and virtual private servers. They operate with a global network of servers and data centers. Founded in 2001, HostDime is a leading web hosting provider based in Mexico. The company is ranked among the top 50 cloud hosting providers in the world. They have over 250 employees and own their own data centers, which are located in Mexico and America. Their website and support are in Spanish and English. The majority of their customer base is located in Mexico; however, they also serve customers from countries such as France, Israel, Colombia, and Bangladesh. The most notable feature of HostDime is their global infrastructure. They own and manage their own data centers with 24/7 on and off-site engineers. Both their American and Mexican data centers utilize fully-redundant power systems and networks, and they’re protected by comprehensive fire suppression protocols and a high level of security. Ideally, HostDime aims to have 100% availability, but they’ve also backed up their commitment to the customer with a 99.9% availability SLA. To be honest, this is a tad low for the enterprise-class solutions they’re offering. Moreover, the small print indicates that you need to provide a written request within seven days of the downtime to receive any credit. HostDime’s prices are very affordable, if a little confusing. Though they indicate a dollar sign on their website, the prices are actually listed in Mexican Pesos. However, after performing a quick currency conversion, you’ll find that prices are very competitive with both the local and international market. You can pay for the server rentals on a monthly basis. If you prepay for a year’s worth of hosting though, you’ll get one month of hosting fees off your total price. This offer is only applicable for new customers, so the discount will no longer be applicable upon renewal. There is no free trial or free version, but that’s to be expected for hosting solutions of their level. HostDime does offer a money back guarantee; however, it’s a little strict. For example, you can request a refund if you didn’t receive any features listed in the package you bought. You cannot request a refund for any other reason. What’s more, they will only refund the fees for the current month and future months, and not the previous months you’ve paid for. HostDime really excels at customer service. They have a variety of ways for customers to get in touch with them: email, telephone, ticket, and live chat. For technical support, assistance is available 24/7; for sales inquiries, they are available from Monday to Friday 8:00 a.m. to 6:00 p.m. and Saturdays from 10:00 a.m. to 3:00 p.m.
I’ve contacted them many times via live chat and have always been very impressed with their customer service. Not only do they always answer within seconds, but they’ve also always been polite and well-informed. In the one event they were unable to answer my question, they submitted a support ticket on my behalf and asked the relevant team member to follow up. I was slightly disappointed with their help documentation, however; there are only a few available on each topic. HostDime is a global provider of website hosting. Not only do they have data centers in Mexico and America, but they’ve also opened support offices in India, Colombia, Brazil, and even the United Kingdom. 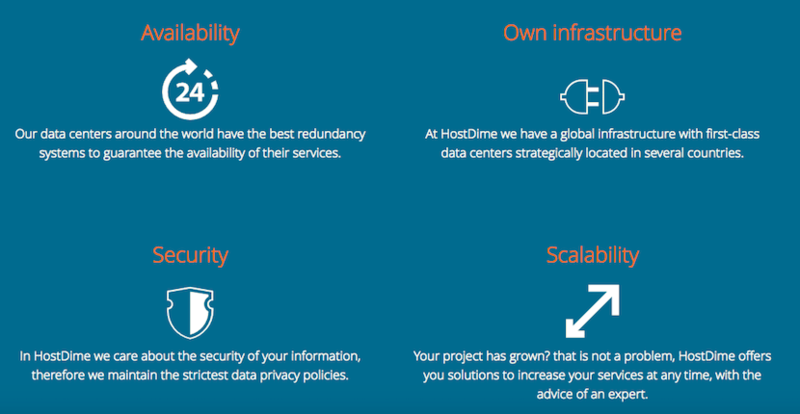 Wondering how HostDime stacks up against other Web Hosting companies? Enter any other Web Hosting company and we will give you a side-by-side comparison.